These honey drops are perfect for sore throats, Halloween, or anytime you want a bit of sweetness in your mouth. One of our customers recommends dissolving one in a cup of hot tea - she says it is the perfect amount of sweetener! Ingredients: Sugar, corn syrup, honey, corn starch, artificial flavors, artificial colors (FD&C Yellow 5, Red 40, Blue 1), and soy lecithin. Serving size: 2 pieces, which contains 50 calories and 13g carbohydrates (9 from sugar) (4% DV). 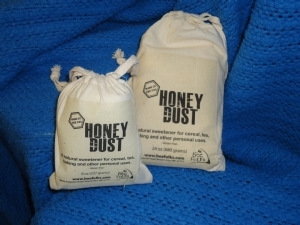 Honey Dust is free-flowing granular mix of sugar and dried honey. Use this if you feel more comfortable with a granular sweetener, yet desire the distinct flavor of honey in your products. 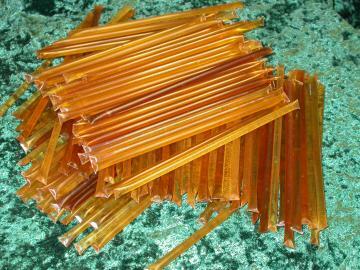 Honey Dust can be used as a one-to-one replacement for either cane sugar or honey. Honey Dust is made with real honey, and is instantly soluble and non-hygroscopic. Applications include baked goods, confections, cereals, seasoning blends, snacks, sauces, and beverages.